Extremist rebels have taken control of much of northern Mali since March and have allied themselves with the Tuareg people of the region. Secretary of State Hillary Clinton is holding talks on ways to deal with the issue. The best chance for breaking the extremists’ hold on northern Mali may be persuading the region’s moderate Tuareg people to reconcile with the military-controlled South of the country. U.S. Secretary of State Hillary Clinton was in Algeria this week seeking the country’s support for a West African force to help Mali’s military regain control of the north. And her talks with President Abdelaziz Bouteflika were dominated by the issue of how to deal with the terrorists and Islamic fundamentalists who took control of more than two-thirds of Mali after a coup toppled the government in Bamako last March. Since then, the extremists have allowed the terrorist group al-Qaida in the Islamic Maghreb, or AQIM, to extend its already-considerable reach throughout the Sahel region. Secretary Clinton says AQIM is working with other extremists to undermine democratic transitions in North Africa. She adds that the group was part of the attack on the U.S. mission in the Libyan city of Benghazi that killed Ambassador Chris Stevens and three other Americans in September. One possible approach to countering the extremists and their terrorist allies came up during Secretary Clinton’s meeting with Mr. Bouteflika — that Algeria might intercede with the Tuareg people of northern Mali, many of whom have allied themselves with the extremists. The idea was that without help from the Tuaregs, the extremists would lose their support, allowing Bamako to re-establish its control of the north. A military approach also is in the works. The Economic Community of West African States (ECOWAS) is working with Mali’s military-backed transitional authority in Bamako on plans for a 3,300-strong military force to help retrain the army and retake the north. Like the East African AMISOM force in Somalia, that West African force will depend heavily on international support for military intelligence and logistics. So Algeria’s help is crucial. Greater U.S. involvement in that effort should go some way toward soothing Algerian unease about the prominent role that the French are playing in preparing the ECOWAS force. That U.S. involvement is an extension of Washington’s existing counterterrorism cooperation with Algiers. Recognizing the security threat along its own 2,000 kilometer border with Mali, Algeria is looking for a political solution. 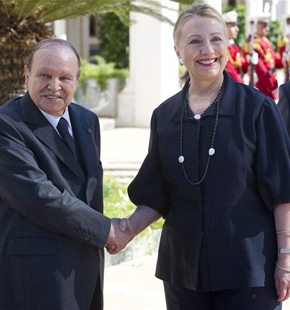 In his talks with Secretary Clinton, President Bouteflika spoke of Algeria’s historic role as a mediator between Bamako and the Tuaregs, an ethnic Berber people who inhabit parts of Mali and other nations in the Sahara region. He also spoke about how the extremists in northern Mali are trying to exploit Tuareg grievances. With this in mind, Secretary Clinton says the counterterrorism efforts and a political process must therefore be mutually reinforcing. “We need to ensure that the political process within Mali addresses the legitimate grievances of the moderate faction of the Tuaregs so that they see their future as lying within a democratic, unitary Mali, and to reduce the space for extremists to act,” says a senior State Department official. The targets for that effort are more the moderate elements in the Tuareg rebel militia, Ansar Dine. It is believed these elements may be more approachable than more extreme factions such as the Movement for Unity and Jihad in West Africa. U.S. officials say there is also a push to counter the way the extremists are financing their activities through kidnapping for ransom. Efforts are being made to cut links between the Mali extremists and organized crime and drug cartels, the officials say, and to have Algeria’s foreign ministry organize more regular contacts with counterparts in Libya, Morocco, Mauritania, and Tunisia. 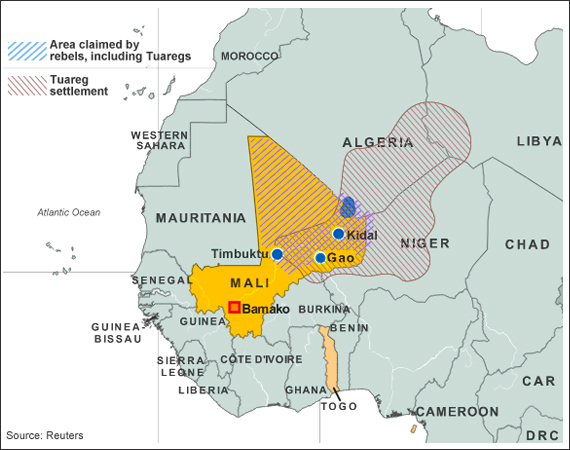 Mali already has a Transitional Government supported by the majority of the Malian people. The focus now is on 1) recovering the North and 2) making sure that those who stole the country blind until March never return. The focus of the West should be three fold: bringing in the resources needed by the Malian Army to prosecute the war, restarting the foreign aid needed to get the depressed economy growing again since the aid cut-off in April, and helping to prosecute those who benefited from corruption in the past and to put in place systems to assure that resources are used properly in the future. Mali’s military which was looted by the henchmen of the former regime needs to be rebuilt along the lines of the US Army which is much admired and respected in Mali. It needs arms, training, logistics, intelligence and air support. With these it can reincorporate the north at a fraction of the cost and of the time needed by an ineffectual hodgepodge of West African troops and bureaucrats. West African troops have no desert warfare experience and were ineffectual a decade ago, prolonging conflicts in Liberia and Sierra Leone for years. Negotiations with Tuareg rebels and AQIM extremists is counterproductive and out of the question. Western countries also need to provide development assistance in the South now and in the North as soon as it is reincorporated. The US needs to provide “leadership from the front” for both the military and the development challenges Mali is facing. France and the other European countries need to stop subsidizing AQIM with ransom payments for hostages and need to concentrate suppressing the other major source of income for Al Qaeda and for corrupt politicians: the drug trade. Western companies known for their corporate social responsibility, need to partner with Mali to develop northern oil and gas resources and to expand gold mining which has continued uninterrupted by war and Byzantine politics. Malians on their own will come up with a real democratic system. They don’t need more sham elections such as those of the past which were misrepresented as “democratic;” in fact elections were a cover for machine politics, corruption and impunity from prosecution. Politicians who made personal fortunes under the democratic façade over the past 20 years must never be allowed to return. Malians, not the US or the AU, need to determine when and how elections are held and what form its democracy takes, all this after the North is reincorporated through military action. You obviously know what you’re talking about. A refreshing and rare treat. Unfortunately, the human mind prefers hysteria and finger-pointing, with historical blindness, over logic and reason. Call me a cynic, but I don’t see a pretty outcome for the eternal Black African vs. Arab conflict. At this point in history it is too late to change the motivations of the actors, we should concentrate on guiding the outcome to our, and the majority of Malians, benefit. I remain hopeful that the US and its partners will commit resources both military and developmental which permit the incorporation of the entire northern part of Mali into the national economy and the denial of the territory to the criminals who use it for drug- and human trafficking, smuggling to avoid taxes, and bases for the Salafists to attack Malian and western interests. To avoid the conflict between south and north, additional support to the north has to be in addition to and not in replacement of developmental resources which would have otherwise have gone to the south in normal times. If this is not the case, envy in the South could stymie efforts to develop the north and incorpated it into the national society. Yet another problem which the Yanks’ve caused but everyone else is expected to sort out. Pathetic. Jono, this one is on you Euros. How in the world do you blame the U.S. for three centuries of colonialism and exploitation in Africa that Europe is responsible for? Also the creation of fake boundaries and nations in order to divvy up the resources of the continent. This is the true cause of all of Africa’s, and most of the world’s, problems. So look in the mirror for once and stop blaming the U.S. for a messed up world Europe largely created. It is too easy to blame European colonialists for that state of civil war, in Mali, and elsewhere! Africa has been independent since1960. What did Africans make during these last 50 years? Tribal wars, and corruption of the leaders, unfortunately…! 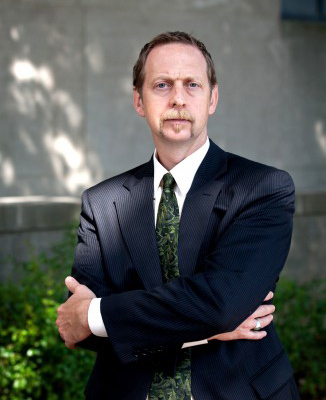 Scott Stearns is VOA’s State Department correspondent. He has worked as VOA’s Dakar Bureau Chief, White House correspondent, and Nairobi Bureau Chief since beginning his career as a freelance reporter in the Liberian civil war. He has written for the BBC, UPI, the Associated Press, The Jerusalem Post, and The Economist. Scott has a Bachelors and Masters in Journalism from Northwestern University.